Michael Janisch toured the UK in 2011 – playing a memorable concert at the Lit and Phil in Newcastle – culminating in this two-CD live recording made at the Soho Pizza Express in London. Disc One – with a running time of little over half an hour – comprises a seven part work written by Janisch. The Paradigm Shift Suite; four movements, an interlude and two bookending pieces (‘intro’ and ‘outro’). The movements, or sections, feature some of the best ‘on-the-bandstand’ jazz improvisations committed to disc in recent times. Janisch assembled a superb band for the project; Americans Jason Palmer (trumpet) and drummer Colin Stranahan, County Durham’s Paul Booth (reeds and percussion), pianist Leonardo Genovese and, the manipulator of electronics, Alex Bonney. The writing reveals Janisch, the American, as someone who has absorbed the musical legacy of his country of birth. A hard bop flame burns brightly in expansive solo improvisations, the bandleader’s electric bass lines reference the Miroslav Vitouš-Joe Zawinul Weather Report era and subtle hip hop rhythms surface at intervals. The soloists are exceptionally good – Jason Palmer fiery on Paradigm Shift Dance Party, Paul Booth, on tenor, in incendiary form on Celestial Dictator. Movement III consists of three parts ranging from furious blowing to ethereal soundscapes (Booth, flute). Janisch’s daughters inspired the fourth movement – Liza-Flo – and a solo bass piece closes the first of the CDs. Disc Two, Mikey’s Mosey – coming in at just over the hour mark – further documents the band in fine form. Janisch showcases compositions from band mates. Argentinian pianist Genovese contributes Chagaraga. Imagine front line horns in unison, a kind of Parisian Thoroughfare for the twenty first century, busy, bustling, bristling with cracking solos. A determined bass line sets in motion Mikey’s Mosey; fun, complex, akin to a Mingus work shop session. The JJ I Knew (Intermission) hears Janisch in reflective mood remembering his late brother Joseph. The elegiac sound of Janisch’s electric bass says it all. Jason Palmer’s Crash begins slowly. Short energetic bursts punctuate the piece, someone references Milestones then all hell breaks loose with furious, swinging ensemble playing. 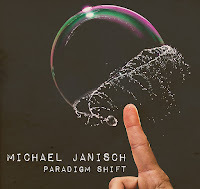 Audience whoops tell the tale – Michael Janisch’s Paradigm Shift is one monster album! Michael Janisch’s Paradigm Shift is released on Whirlwind Recordings (WR4676) on Friday 2 October. The band continues its tour of all four corners of the UK. Scarborough Jazz Festival is on the itinerary (Sunday 27 September), the Jazz Bar, Edinburgh (30) and every nook and cranny in the Scottish Highlands and Islands will get to hear Janisch & co before they head south of the border to visit the Pizza Express, London (October 6) and a number of other venues. It should be noted that trumpeter Jason Palmer and pianist Leo Genovese aren’t on the tour. Paul Booth, Alex Bonney and Colin Stranahan are, and they will be joined on some dates by Jason Yarde (reeds), pianist Cédric Henriot and drummer Andrew ‘Faces’ Bain. Recommended – tour and CD. Visit: www.michaeljanisch.com.